We designed and developed new types of nodes for enabling networking of common-place objects: Energy Harvesting Active Networked Tags (EnHANTs). We envision EnHants as small, flexible, self-powered wireless tags of a form factor that would be attached to objects that are traditionally not networked (books, furniture, walls, doors, toys, keys, clothing, produce). As such, EnHANTs will be providing the infrastructure for novel tracking applications, for example, locating misplaced objects and continuous peer-based object monitoring. In order for the EnHANTs to communicate and network while harvesting low levels of environmental energy (for example, indoors, harvesting the energy of the indoor lights), they have to spend substantially less energy than Bluetooth, Zigbee, and other existing low-power communication technologies. Furthermore, the enabling technologies for the EnHANTs also have many paradigm-shifting implications on the design of higher-layer protocols. 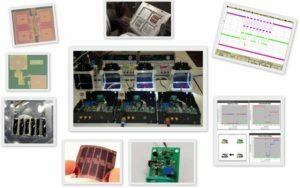 For several years I led a cross-disciplinary multi-group effort in designing and developing the EnHANT prototypes and prototype testbed. The prototypes were the first wireless devices to demonstrate multihop data forwarding over ultra-low-power UWB physical layer. The testbed was the first to support trace-based light energy control functionality and the first to allow for repeatable experiments with energy harvesting adaptive communication protocols with real energy harvesting hardware. This work appeared in Proc. of ACM MobiCom [PDF], IEEE INFOCOM [PDF], and in the IEEE Wireless Communications Magazine [PDF] and IEEE Transactions on Sensor Networks [PDF]. It was demonstrated at IEEE SECON [PDF], IEEE INFOCOM [PDF], ACM MobiCom [PDF], ACM SenSys [PDF], and ACM MobiSys [PDF]. The IEEE Wireless Communications Magazine paper was chosen as a top 3 pick for 2014 by the IEEE Communications Technology News [article link]. This work received the IEEE Communications Society Award for Advances in Communications [award info] and the ACM SenSys Best Student Demonstration Award [award info].